The bet365 bookie is one of the oldest and most popular in its field. The company enjoys great prestige among players from all over the world and offers bettors bets to do win-win deals. bet365 was created 18 years ago in the city of Stoke-on-Trent, in England. The company was founded by Denise Coates, the daughter of an experienced bookmaker, who once worked at ground stations for receiving bets. It took the woman 12 months to make up a team of specialists and develop a software platform. In 2001, the company launched its official website. bet365 first began to pay attention to the second size tournaments. This allowed the company to create wider lines and gain an advantage over competitors. Since 2004, many language versions have appeared on the company’s website, which has helped the company to enter new markets. bet365 has improved many services as it develops. Now on the company’s website, in addition to betting services, you can find online games, slot machines and other gambling services. This company was the first to give players the opportunity to make live bets. This has become one of the most important aspects of the company’s development. The bookie regularly becomes a sponsor of various football clubs. Six years ago, the company became a sponsor of The Stoke City Fun Club. Two years ago, bet365 became the title sponsor of the stadium of the same team. At the same time, the company entered into sponsorship agreements with the Bulgarian football clubs Ludogorets and Slavia. Denise Coates still manages the betting shop. She owns 50.1 percent of the company’s shares. The management team also includes her brother and father. bet365 is an innovative company. This bookmaker was one of the first to legalize e-sports bets. In addition, the company was the first among bookmakers to broadcast a football match online and introduced a quick bet calculation function. Today bet365 is one of the most popular bookmakers in the world. Offline the company works only on race tracks. The organization employs 3.5 thousand people. The company has 20 million customers from 200 countries. In the beginning the bookmaker focused only on Britain. Now Europe and Asia are a priority for the company. Simple design. European bookmakers usually make their sites as simple as possible in design. bet365 is also among them. The dark green colors of the website are a matter of taste. The rest of the site is simple, convenient and understandable. All important things can be seen immediately. Upon entering the site, a player will immediately find what they need: bets, slot machines, poker, etc. Top tournaments are displayed by the company in the prominent place — in the upper right part of the screen. Currently, the most popular international football matches, the Champions League and the NBA regular season games. The relevant sporting events are always recorded there every day. All available sports are on the left side of the screen. This is a standard solution for many bookmakers. At the top of the site there is search, tabs for login / registration, website settings and access to services; at the bottom you can find contacts, help and statistics. In the center there are current sporting events. Pay attention! There is no Russian version on the bet365 website. This is perhaps the only disadvantage. At the same time, the website supports 19 language versions. Generally, the basic knowledge of English will be enough for a game on the bet365 website. People who know sports terminology will simply understand the portal, since most of the terms are taken from English. If you are among the bettors who do not know English at all and have little understanding of sports terminology, you’d rather not play at this bookie. It may be easier for someone to understand the site in German, Italian, Spanish or Bulgarian. On the right side of the bet365 website you can find the most popular sports events that are prepared for the start. If a player is interested in nothing suggested by the bookmaker, they can go to the left side of the site where the list of all available sports is. There one needs to choose a sport, and then an event. Bet365 is famous for its wide action lines. At one event, sometimes you can find up to 120 proposition bets. You can bet on the outcome of matches, statistics of teams and individual athletes, as well as handicaps. At bet365 the minimum bet is $ 0.2 or £0.1. The bookmaker allows betting up to 3 thousand dollars at most. The sum of the bet on TOP events can grow up to 50 thousand dollars. But in case of a big win, the company may require the player to personally visit one of the offices. The bets before the start of the event (pre-match), are calculated by the company’s specialists within at least 5 minutes, within 60 – at most. The profit margin in this type of bets varies from 4 to 6 percent, which is considered an acceptable indicator. Like all online betting shops, bet365 offers players live betting. You can find current events immediately by visiting the bookmaker’s site. Players can not only bet on live events, but also watch many of them live. The profit margin ranges from 8 percent to 10 percent, and the bet itself is calculated within 5-15 minutes. In general, the odds at bet365 are not the highest, but above average in many sports. Deficiencies in the odds are leveled due to an acceptable margin, a large selection of events and wide lines. bet365 suggests future players to go through the standard registration procedure. Since the site does not have the Russian version, the authorization field needs to be filled in English. First, a player should specify the country of the residence, gender, name and surname. Next, there is also a standard procedure to specify the date of birth, e-mail and contact phone. In the last field it is important to indicate the correct country code. The employees of bet365 do not speak Russian, but can call any country, if necessary. In addition, a player needs to choose the way they want to receive notifications from the company. In the process of registration, it is important to provide reliable personal and contact details, as well as the address of the residence. Pay attention! At the first deposit, bet365 may require the client to be verified. This means that the player will need to send the company their scanned copies of documents proving their identity. Otherwise, there may be problems with betting or withdrawing money. Importantly! A user must confirm that they are 18 years old. Minors are not allowed to play at the betting shop. To be on the safe side, the company may require a player to provide a copy of the documents to confirm their coming of age. At the end of registration, a user creates their account, that is, a game account. Bet365 does not support the currencies of CIS countries. However, players from these states can use the services of this bookmaker. Access is blocked only for residents of Uzbekistan and Turkmenistan. Financial transactions can be carried out in three currencies: dollars, euros and British pounds. Bank transfer. Money will be transferred to your account within 2-10 days. The minimum you can put in to the account is 200 dollars, the maximum is 100 thousand. Mastercard and Visa cards. The minimum deposit is 10 dollars, the maximum is 30 thousand. The minimum is 10 dollars, the maximum is 38 thousand. The minimum deposit is 50 dollars, the maximum is 50 thousand. The minimum deposit is 20 dollars, the maximum is 30 thousand. The minimum deposit amount is 5 dollars, the maximum is 400 dollars. Bank transfer. The minimum you can withdraw is 40 dollars, the maximum is 50 thousand. Mastercard and Visa cards. The minimum withdrawal amount is 10 dollars, the maximum is 30 thousand. Skrill. The minimum withdrawal is 10 dollars, the maximum is 38 thousand. Neteller. The minimum withdrawal amount is 20 dollars, the maximum is 38 thousand. Enteropay. The minimum withdrawal is 25 dollars, the maximum is 30 thousand. Through electronic payment systems, money is transferred to the gaming account instantly. If you win, the funds will arrive on the same type of the payment system within 12-24 hours after the withdrawal order. It will take only a few seconds to make a deposit via bank (international) cards, but it will be possible to withdraw money to the card only within 1-5 days. A bank transfer is most time consuming. Money after depositing in a similar way will be transferred to the account in 2-10 days. Withdrawing funds to a bank account takes the same time. Please note that you cannot withdraw money through the Qiwi system. Currently there is a promotion for football fans. bet365 invites users to bet on a pre-match that their chosen team will be winning the match with two goals. As soon as this happens, the bet will play. The player will receive money regardless of how the match ends. You can bet on the matches of the championships of England and Spain, as well as the matches of the group round the Champions League and the European League. The bet365 bookie offers players bonuses for combo bets (trebles and multifold bets). This applies only to football, namely the matches of the championships in England, Spain, Italy, Germany and all stages of the Champions League. You can bet only on the outcome of a match. The more guessed positions, the higher the bookmaker will raise the win. The minimum you can get is a 5 percent bonus for guessing three positions, the maximum — a 100 percent bonus for guessing 14 positions. Both bonuses are relevant now for new players and loyalty program participants. No bonuses are granted for registration. But after authorization, providing you have a positive balance on your personal account, you can watch online sports events. bet365 allows you to use its services through mobile devices. You can enter the company’s website through a smartphone or tablet. Both OS versions are supported: Android and iOS. In the mobile version all the main functions of the site are available except live chat and bingo. Special mobile applications will make the player’s stay on the site more interesting. bet365 allows users to watch sports broadcasts not only on a computer, but also on a mobile device. A player can also install special applications through which they will receive on the smartphone the latest news from the bookmaker, as well as offers with bonuses and promotions. 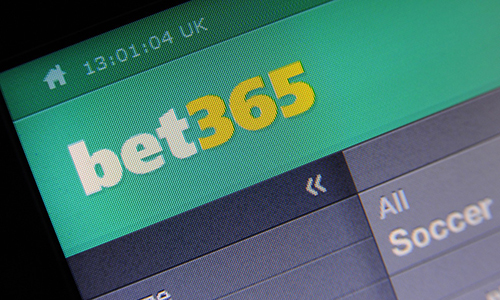 The applications from the bet365 website can be installed by users of all iOS versions. As for Android, the operating system must be version 6 or higher. To receive notifications from the bookmaker you should enable notifications from this source in the settings of the smartphone. Bet365 has many technical support employees, which includes support service. Since the site does not support the Russian version, the company’s specialists also do not communicate in Russian. This can be a problem for players from CIS countries who do not understand English well. In this case, they will have no one to ask for help in the event of a dispute. The Former Soviet Union is not a target market for bet365. The launch of the Russian-speaking department for the players of this segment is not planned yet. Players who understand English can contact support. There are no serious complaints about the competence of the company’s specialists. The easiest way to contact a bookmaker representative is to write to them using live chat. The specialist answers on average within 1-5 minutes. However, you can use live chat only on a computer. Another way to instantly contact bet365 customer support is to call the number listed on the website. In this case, you should not only understand English, but also be able to speak it. You can also email the company. But in this case, the answer can wait a few hours, because the company receives a lot of emails.